Coffee. First thing in the morning. No exceptions. No negotiation. Even if you, personally, are not a coffee drinker, you probably live with one and recognize the futility of trying to converse or do pretty much anything until at least that first cup of coffee has been consumed. It doesn’t matter if we are talking about folks living in a high-rise in New York City or on the family farm in Iowa. For more than 60 percent of Americans, coffee starts the morning with us and travels with us throughout the rest of the day. It may be that there are places where people are more obsessed with the kind of coffee they drink than others are. Single-cup coffee makers are rapidly finding their way into homes in small town and rural areas all across the U.S., but it is in the larger metro areas that specialty blends and gourmet varieties have become an integral way of life. Actual surveys have been done, and it has been determined that, if you were dropped anywhere in Manhattan or Queens, you would be no more than 1,335 feet from a Starbucks, which equates to about five blocks. That is the farthest. On average, 20 percent of the island has a Starbucks every two blocks! Coffee consumption had started to taper off in recent years, but last year it jumped back up. No one knows exactly why. Millennials drink more than their share and that, no doubt, accounts for a part of the resurgence. More likely, however, is that we just love our coffee, even though we believe it probably isn’t good for us. One of the main reasons for that is the concern about coffee damaging our teeth. 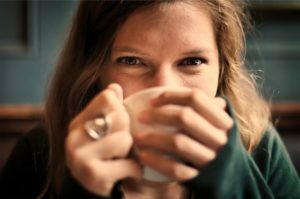 How Does Coffee Affect Teeth? The enamel on the outside of teeth is the hardest substance in the body. It is important to maintain the integrity of the enamel so that the teeth can perform their chewing function and can also protect the interior layers of the tooth. Everyone knows that coffee is acidic, which has the effect of softening the enamel. What is not as well-known but extremely important is that the softening is only temporary. Rinsing the mouth with water after drinking coffee is helpful, but brushing right way can damage the enamel and the dentin layer underneath it. Always wait at least 30 minutes after drinking coffee, wine or any other acidic beverage before brushing. There is, however, a high likelihood of staining as a result of coffee building up in the small holes and ridges in the enamel, and it is believed that it only takes one cup a day for evidence of staining to appear. Staining happens with natural teeth as well as the materials used in restorations. Once again, rinsing with water as soon as possible after drinking coffee is recommended, although it may not be sufficient to prevent staining. If this is the case, your dental professional will be able to suggest whitening methods that are safe and effective. The good news is that coffee actually has a lot of positive benefits. It is now believed to play a role in protecting the liver and reducing the risks of cancer, heart disease, and diabetes. It may also actually protect the teeth by helping to prevent bone loss in the jaw.